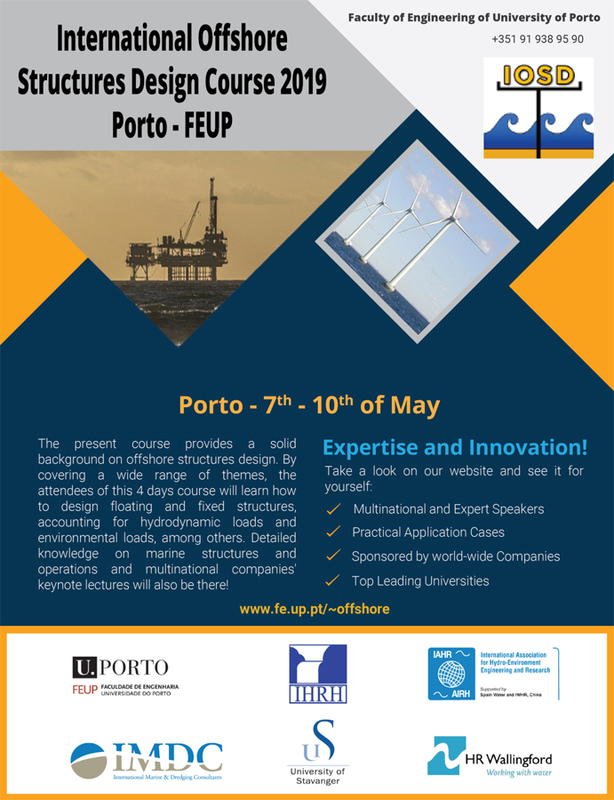 The course will be held at the Faculty of Engineering of University of Porto (FEUP) between the 7th and the 10th of May 2019. The course will count with the collaboration of members from HR Wallingford, IMDC, Bologna University, University of Stavanger, University of Aalborg, among other institutions and intends to provide a solid background on the design of offshore structures. By covering a wide range of themes, the attendees will learn how to design floating and fixed structures, accounting for hydrodynamic loads and environmental loads, among others. Detailed knowledge on marine operations and multinational companies' keynote lectures will also be provided. Other particular issues as scour phenomena, cable burial and physical modelling will be also be addressed. Note that the number of registrations is limited.